Many Christians today are familiar with two types of ethics: “Biblical” and “non-Biblical.” Or perhaps in laymen reductionism: “objective” and “subjective.” This mild exaggeration aside, it is intriguing that something every living person participates in goes unstudied by many. Simplifications rule the day. However, a vast array of ethical systems span the Biblical/non-Biblical and objective/subjective generalizations. Even the definition of “ethics” broadly varies through historical systems. In light of this Beyond Bumper Sticker Ethics: An Introduction to Theories of Right and Wrong is a valuable resource for the church and its instruction. Covering more than simply Christian Ethics, the volume serves as a valuable and critical introduction to ethics (24-27). Authored by Steve Wilkens, this second edition of Beyond Bumper Sticker Ethics has the clarity of a seasoned professor. Introducing twelve distinct ethical systems in a compressed volume is no small. Wilkens expertly provides a general introduction, a detailed description of the ethical system, a summary, positive points for the system, and potential problems (in the form of questions and discussion). This format facilitates greater learning and is excellent as a collegiate textbook or for church/private weekly study. Beyond Bumper Sticker Ethics presents these ethical systems in a constructive way. Starting with the “systems whose elements contradict basic aspects of a Christian worldview” and moving toward “methods that consciously begin as attempts…within the context of Christianity” (25) a full spectrum of ethical thought is presented. Retaining valuable chapters on behaviorism (chapter 4), Kantian ethics (chapter 7), and virtue ethics (chapter 8), this new edition adds chapters dealing with evolutionary ethics (chapter 5) and narrative ethics (chapter 9). Far from providing caricatures for Christians to shrug off, each chapter provides an opportunity for deep contextual learning and correction of simplistic misconceptions. Examples of these learning opportunities include the distinction between cultural relativism and individual (hyper) relativism (32), “group survival” in evolutionary ethics that supports the development of gracious characteristics (79), and the anti-enlightenment/modernism paradigm of narrative ethics (147-153). The “necessary evils” of an introduction are evident and acknowledged by Wilkens (217). Each system is presented in its general form and variants go undiscussed. In another vein, questions and critical thought are provided in Beyond Bumper Sticker Ethics instead of straight answers. This is evident in the “Potential Problems” discussions for each system. Some of these sections provide excellent, thought-provoking questions while some will leave only more questions. Ultimately, this leaves readers with personal homework and further study (as an introduction should). This may frustrate some readers, much like Plato’s Theaetetus frustrates Wilken’s students (213, 221), but it provides an introduction to both ethical systems and critical thinking. 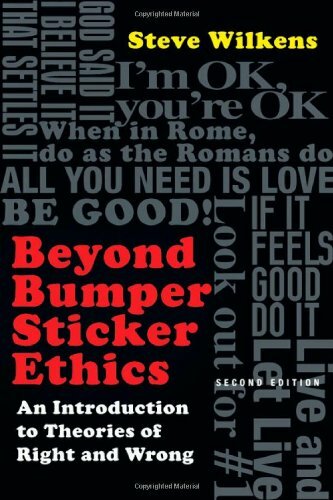 In conclusion, Beyond Bumper Sticker Ethics is phenomenal as classroom material to introduce ethics. Colleges, churches, Bible studies, and even home education will benefit greatly from the questions this volume asks and the critical evaluations that develop. The introduction to a wide range of ethics will provide valuable insights to a deep and difficult subject which everyone practices on a daily basis.